UPDATE 11/15/18 3:30 p.m. The traffic signal at Knickerbocker Road and Valleyview Drive was damaged Wednesday, Nov. 14. For the next few weeks, all directions of traffic will be controlled by a flashing red light, requiring all vehicles to stop. The estimated time for repairs and replacement to the traffic light is 30-45 days. For added safety, the signal at Knickerbocker Road and Bentwood Drive has also been placed in a flashing red to slow traffic as it approaches Valleyview from the east. SAN ANGELO,TX -- Traffic has been slowed at the intersection of Knickerbocker Rd. and Valley View Blvd after a big rig snagged the signal light knocking out the signal light. According to witnesses at the scene, the traffic signal pole on the corner by the Stripes convenience store was knocked down. 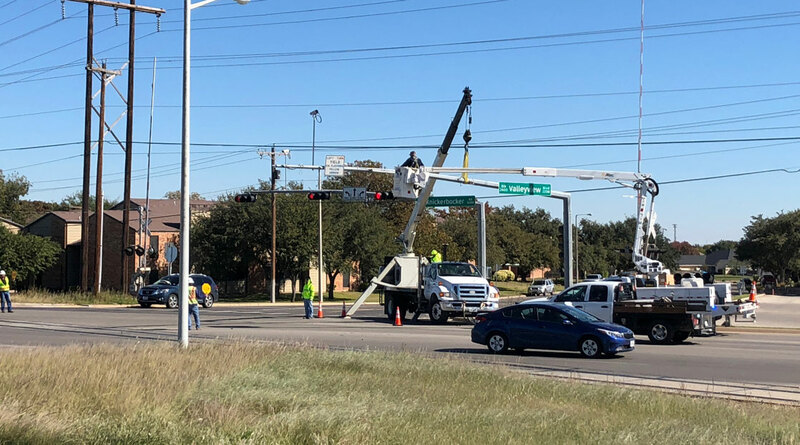 Crews with the San Angelo office of the Texas Department of Transportation were at the intersection by the Walmart Neighborhood Market Wednesday afternoon directing traffic and working to correct the downed pole. We are awaiting an official statement from TxDot. There is no timeline information available at this time as to when the traffic signal will be repaired. Workers expect traffic to be backed up on Knickerbocker Rd. Thursday morning during drive time. When a traffic signal ceases to work, State Law requires the intersection be treated as a four way stop. It is expected that temporary stop signs will be erected at the intersection. That is true. The stunts they pull in movies are fun to watch and no doubt pulled off by some of the world's best stunt drivers. There are people who can drive like that, but they are professionals and extremely talented. In real life though it would be more like the story I heard about with the Georgia Highway patrol. They were in high speed pursuit of some person for quite a few miles and the situation was getting worse. Little did he know coming up around the next turn they had stationed a sharp shooter. He turned him off like a switch. High speed pursuit over. Game over. A famous quote from Jackie Gleason.. This has nothing to do with the Germans. symphony orchestras recognize the various instruments involved. great musicians and comedy writers. What did he say ? it was all just conjured up with someone with too much imagination. I can imagine it probably was based on an ounce of truth. She married some guy her dad didn't like and he forgot all about who he was.